BIOCOR is a unique device that aids in shifting and correcting your energy state and balance through the use of high frequencies. This device can be used independently from BioWell or it can be used in conjunction with the Chakra audio setting in the BioWell software. 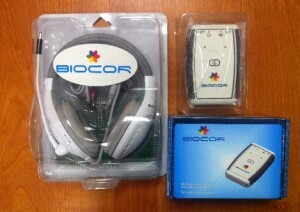 BIOCOR – correction device of human energy field using information extracted fingers with GDV BIO-WELL. These results may help to develop a better quality of life. Biocor uses super Hight Frequency (SHF) in the range Higo-Hertz (4.9 mm (60.12 HHz), 5.6 mm (53,53 HHz) and 7.1 mm (42.19 HHz) of very low intensity (less than 10 mW/cm2). 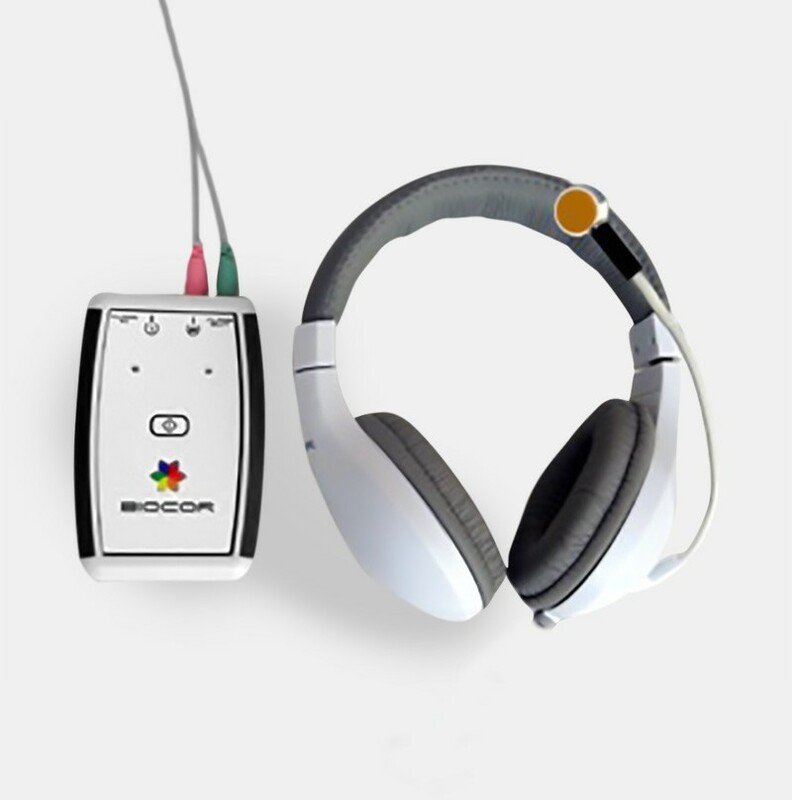 BIOCOR is a combination of Music with Frequency healing based on your own frequency and a special healing music. First musical file is recorded in Tibet from 7 Tibetian Bowls and modified based on your own frequency measured by BioWell. During 10 minutes music slowly transforms to the most positive healing sound. Other 7 musical files for all 7 Chakras are composed by Kimba Arem from Colorado, USA. In these compositions Kimba is using the principle of binaural effect. The brain produces a phenomenon resulting in low-frequency pulsations in the amplitude and sound localization of a perceived sound when two tones at slightly different frequencies are presented separately, one to each of a subject’s ears, using stereo headphones. A beating tone will be perceived, as if the two tones mixed naturally, out of the brain. The frequencies of the tones must be below 1,000 hertz for the beating to be noticeable. The difference between the two frequencies must be small (less than or equal to 30 Hz) for the effect to occur; otherwise, the two tones will be heard separately, and no beat will be perceived. Binaural beats are of interest to neurophysiologists investigating the sense of hearing. Binaural beats reportedly influence the brain in more subtle ways through the entrainment of brainwaves and have been reported to reduce anxiety and to provide other health benefits such as control over pain. I would like to pre-order the BIO-COR. I’m in the midst of purchasing the BIO-WELL system. May I pre-order if I have not yet bought the BIO-WELL device? Please advise. There are awesome FREE APPS(Binaural) in iPhone/ android that is capable of producing binaural beats of any frequency. I don’t understand how this hardware is different and if its the same, what is the use of having a separate hardware when our any audio player can do it. We generate binaural beats using GDV images. Dear Irina, you can order BioCor here: GDVPLANET. Delivery takes time. I have been working on a theory of string harmonics based on visual electro stimulus. I find your camera and tools most interesting. I was wondering if we could collaborate. I would like to order a BIO-COR. where is it? Can I got it in China? or I can ask someone to get it from your company. Please let me know is it possible to buy now one pcs of BIOCOR, how to arramge transfer, and when device will be delivered? Do you have dealer or re-seller in Russia? Will this also work with the GDV camera system? I have the Pro, with all the software and attachments … I am interested in this new technology (BioCor), but do not wish to purchase a BioWell. Thanks for your reply. Dear Beverly, Bio-cor – not. New software – yes. Hi. I was wondering if the Bio-cor is safe for people who have epilepsy or are seizure-prone, since I know binaural beats can sometimes be dangerous in those circumstances. Thanks. I am in the United States (Missouri) and wish to gain complete costs of ordering the Bio Well system and BioCor. Please advise on cost that includes shipping. Thank you! Dear Dr. Mee, please see Bio-Well price-list here.